The children's fitness industry offers a vast marketplace where the potential has now become even greater because of school budget cuts, decreasing opportunities for safe play in parks and neighborhoods, and the appalling state of the physical fitness of our youth. Millions of our children are overweight, inactive and below minimum standards for strength, flexibility and endurance. The need for more children's gyms is apparent, and the field offers an abundance of opportunities to those who love children. History Since 1983, My Gym has established local facilities where children learn and grow through unique and exciting activities. My Gym Kids worldwide develop healthy minds and strong bodies under the guidance of trained and loving instructors in a safe, clean and noncompetitive environment. & Services My Gym programs focus on physical, cognitive, and emotional growth because we view each step of development in these areas as an essential "building block" toward becoming a happy, healthy, well-adjusted human being. Our Building Blocks program is designed to acknowledge My Gym Kids for their efforts and achievements. It is an interactive skill and development tracking and recognition system that provides specific opportunities for our students, teachers, and parents to enjoy and celebrate the attainment of key milestones together. The world has been waiting for My Gym and the reception has been astonishing! By the end of 2011, we were contracted in over 35 countries with operational facilities in 30; and the division has been growing rapidly ever since. It is obvious that parents far and wide have come to realize the importance of children's fitness, so now is the right time to get on board with My Gym International. 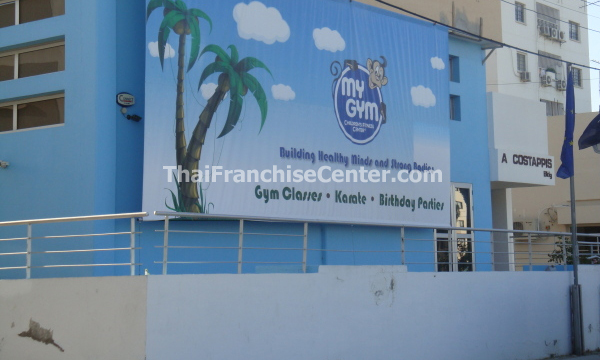 My Gym International is seeking master franchisees, area developers and multi-unit owner/operators. Single franchises are available in Canada, Mexico and many other countries.